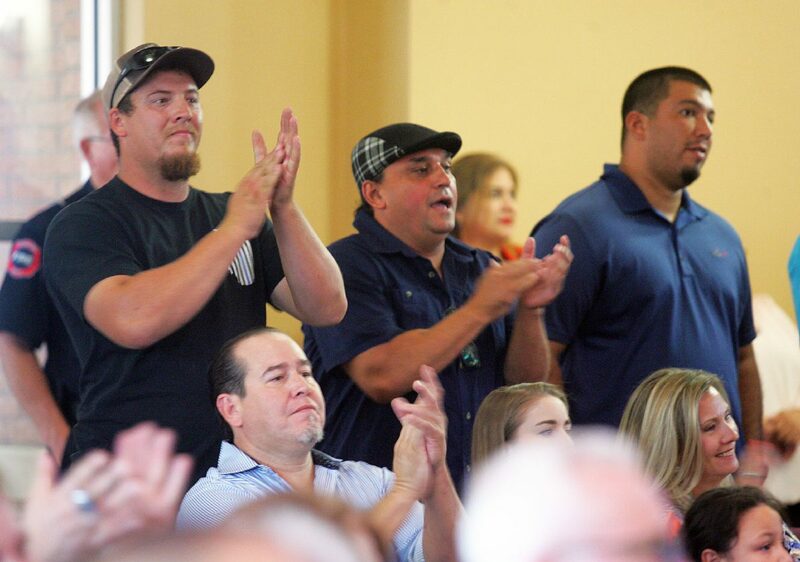 Supporters applaud in support of new park being built on Doolittle road during a Edinburg city council meeting on May 16, 2017 in Edinburg. EDINBURG — The city council here allocated $1 million for the construction of a sports complex — without setting off any fireworks Tuesday evening. City council members unanimously voted to fund the Eisenhower/Memorial Sports Complex without any discussion at their meeting Tuesday. The park, which has been delayed for a year, is a $3.2 million project between the Edinburg school district and the city of Edinburg. Last month, it became a point of contention between the district and the two factions sitting on the city council. School board member Miguel “Mike” Farias and Edinburg Mayor Richard H. Garcia initially battled on social media before taking the dispute to the dais, where Farias alleged the project had been delayed because the majority was playing politics. Garcia alleged the district, which is leading the project, had failed to move an inch. A fence surrounds the soccer fields at the Edinburg Municipal park on May 16, 2017 in Edinburg. The park is a pet project of Richard Molina, who currently sits on the minority faction, and the mayor, who is part of the majority, appeared to insinuate Molina wanted to build the park for personal gain. Molina and his family own several parcels of land near the area — and his critics alleged on Facebook that the new park would benefit them by raising their property value. Farias went on to say he had researched the property surrounding the sports complex. Gasps could be heard from audience members who recognized the names of two members of the prominent, politically active family. The family has produced a number of civic leaders, including Hidalgo County Commissioner Joseph Palacios and his brother Ricardo Palacios, the Edinburg city attorney. Farias then handed the documents to city officials, as his supporters cheered him on. Garcia would get his say after several other members of the public finished giving their remarks. He then pointed toward several cutout boards displaying map renderings of a specific property highlighted in red. “I’m well aware,” Farias said in response to the rendering of what looked like Molina’s property, though neither of them ever mentioned his name. Moments later, Molina offered his reason for supporting the construction of the sports complex: the city had been taking away sports fields from the residents and had not been replacing them. 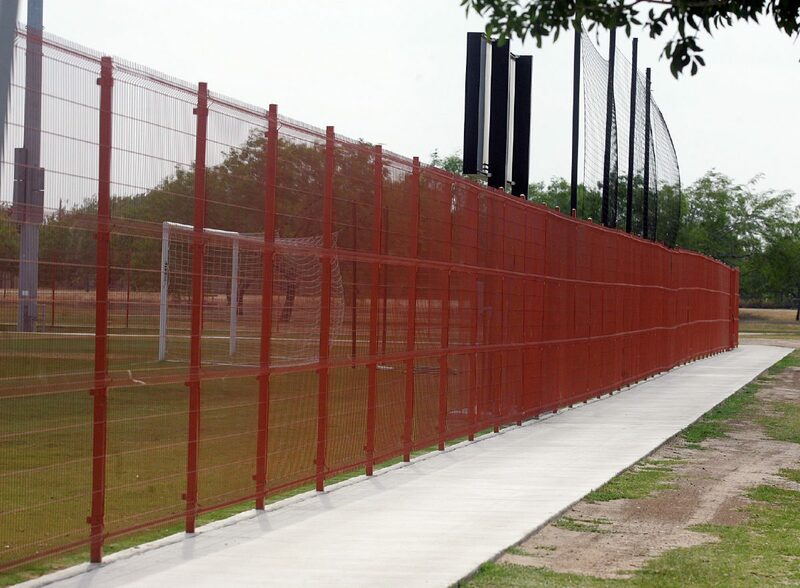 He then shifted his attention to the new soccer fields adjacent to the H-E-B Park, home to the RGV Toros, the United Soccer League affiliate of the Houston Dynamo. Molina went on to say he began pushing for the park after learning the district was considering constructing a softball field in between Eisenhower Elementary and Memorial Middle School, where the district already owned 35 acres. The idea grew into a sports complex that is beginning to gain traction.